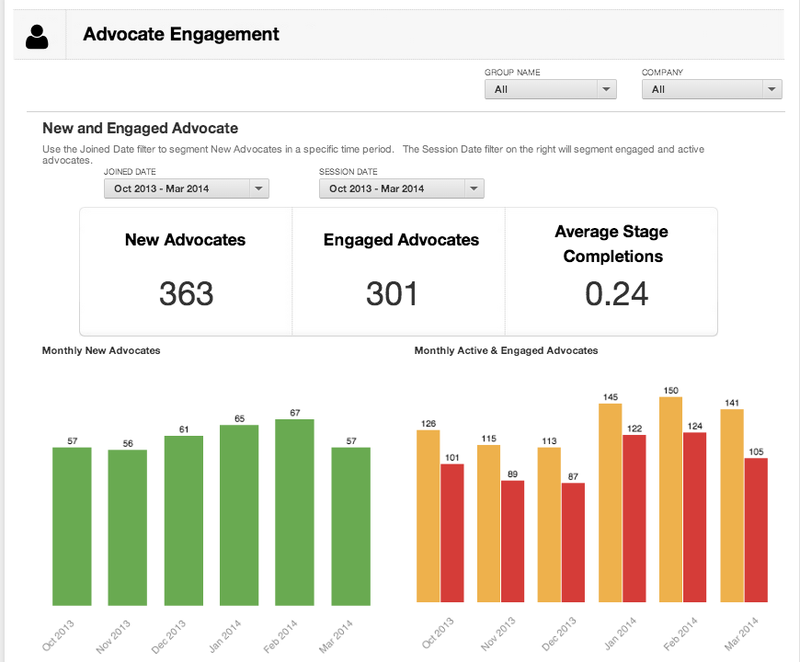 About a year ago, we included a tool called Engagio in a round-up of social media engagement dashboards. Shortly after that, Engagio was acquired by Influitive, which helps companies identify and work with the advocates who love their products. Today, we talk to Influitive’s CEO Mark Organ about advocate marketing, analytics and the Engagio acquisition. Mark, what’s Influitive all about in a nutshell? We help companies mobilize their army of advocates; those people who are really excited about a product or company. Our theory is that there is a big gap between the amount of advocate activity that people are willing and able to do and what they actually do. By making it fun and easy and rewarding for advocates to do referrals, references, case studies and social media buzz and all that great stuff that companies desperately need to drive their sales in the social era, we help companies get their absolute full potential from their advocates by providing a better experience for those advocates. We help companies build advocate programs online and on mobile via portals where advocates can find things that they find fun and rewarding to do. In return they get points, level up, meet other advocates, provide feedback. There’s a community for those advocates to interact with one another. First of all, we make it quite easy for advocates to do what comes naturally to them, which is to advocate. Let’s take a referral. Normally if you were interested in referring new business to a company, it’s not always easy to know who might be a good fit. One of the things that we do is integrate with all the different social networks (this is partly what we used the Engagio technology to do) and we automatically pop up people who advocates may want to refer. We even pre-write some material so they can just make a couple of changes and quickly send it out. That’s just one example, but we have similar types of innovation around setting up reference calls, gathering customer stories, doing online reviews. We make all of those things a lot easier—but more fun and rewarding, as well—by providing points and badges and all that fun stuff. We do that by integrating with CRM systems so that feedback can be provided automatically to the advocate. So you did a reference call, did they do a demo, are they ready to close—all those things are interesting for the advocate. We integrate with the leading CRM systems like Salesforce.com so, as the prospect is moving through the buying process, the advocate receives notifications. And sometimes when things get stuck, the advocate can help. He can call and say “how’s it going? Did you like your product?” That sort of thing can help to unstick things. The advocate really becomes part of the sales team in that way. What other Engagio technology did roll into Influitive? Engagio had very sophisticated Web scraping technology, so we’re able to track in real-time what advocates are doing across the Web and automatically give them feedback and points for doing what they do. For example, when an advocate comments on your blog (Engagio is particularly strong with blogs), we automatically know that has happened. Or if they give a company a five-star review on iTunes or App Exchange or Quora or somewhere on the Web, we track that automatically. That allows us to massively scale up these advocate programs. A typical customer advisory board (which is a very high-end low-scale version of an advocate program) typically has 20 to 25 customers. Our customers are able to generate that level of quality where advocates feel great, they feel like they’re getting personalized attention and we are able to scale that into hundreds or even thousands of advocates. The Engagio technology has helped us to do that. What are the primary benefits of Influitive for marketers? At the tactical level, when working with customer marketers or social media marketers, we help them get a lot more done. For example, if you needed to source four customer stories this month we could help you get those done in a couple of days as opposed to the typical three weeks. If a marketer needed to get 20 five-star reviews in a month, we could help them do that very very quickly. So at the tactical level we help companies get their referrals, references, case studies, and social stories done faster and more effectively. At the strategic level, there are a couple of things. First of all, we generate more of the best quality leads that companies can get because referrals are absolutely the best leads—they close faster, higher order size, lower costs, so there’s a lot of untapped potential for referrals. We help companies realize the full potential of that, which means that they sell more and are more profitable. But the other thing is that advocates are helpful just about everywhere in a buying process. Imagine if every piece of content you wrote got five times as many people sharing it and voting it up and creating buzz around it. It increases the return that you get on the hard work that you pour into your content and the same thing is true on a number of other fronts. Events are another example. A lot of customers sign on with us when they’re having an event coming up. We help them source more sponsors, get more feedback on speakers, and get more speakers at the event. We help get their advocates to bring more prospects to salespeople at the event so that they close business at the event. We help generate a higher return on everything that companies do in marketing. A lot of companies have customer success organizations where companies are quite rightly investing a lot more in making happy customers. Are they getting the full benefit of all that money and time they’re investing in generating elated customers? In many cases, they are not. We help them get their full potential in the investments they are already making. Our customers are some of the fastest growing companies in the world and we think that we have a part to play in that because we help companies get the full benefit of the special people we call advocates. What are the benefits for the advocates? Different people are motivated by different things. We have built our system around the senior manager persona (VPs and above). A lot of those folks are not really that interested in rewards. We do have a reward network so it is possible to cash in your points for everything from a charity donation to a customized T-shirt that is only available for advocates—some people do like that. But about 80% of them are not interested in rewards at all. They are more interested in connecting with their peers and building a better relationship with a company that they care about. They want to see these companies succeed; they want to have influence with the people at the top of these companies. Advocating is a way to do that. We make it easier for them to get the influence that they want. It’s also about being part of a movement. People find it exciting to be part of something bigger than themselves and that’s what advocating helps them do. How does the gamification aspect help reward advocates? That’s just a fancy and fun way to dress up feedback. All organisms, even bacteria, desire feedback. Everybody needs to understand how they are doing. One of the reasons why games are so addictive is because we want that feedback; we want to achieve mastery and skill development. Advocates want to be more effective in that role. We use game mechanics, game dynamics to help them do that. What kind of analytics do you provide on advocate marketing programs? We provide copious data to marketers. The real twist for us that is really unexpected by a lot of customers and prospects is how much we are focused on the advocates themselves as opposed to the things that they do. You might have heard of Aesop’s fable of the goose that lays the golden eggs. We are focused more on the geese than we are on the eggs. We provide analytics for companies on the number of rock-star advocates that they are generating, how their pipeline is working on creating new advocates and where their bottleneck is in that process. We use a lot of the same kind of analytics that some companies are using for their prospect funnels to talk to companies about the advocate assets that they are growing and nurturing. That’s a big part of our agenda; that’s why we call ourselves advocate marketing and not advocacy marketing. We’re going against the grain on that. We are very religious on the point that it’s the advocates who are the special people who do the work. When these people have a great experience they are much more likely to do great things and give more of the golden eggs that we all want. The advocate for us is the center of our world. They are the people we ultimately serve, more than even the companies who pay us so we provide a lot of analytics on the people. We do provide analytics on the golden eggs they produce as well, but it’s the analytics on the people that makes us special on that front. In part two of this interview, Mark will cover in more detail the difference between advocate and influencer marketing, assess the issues with current marketing strategies and make some predictions for the future. The post Looking after the Geese: Influitive and Advocate Marketing [Interview] appeared first on The Daily Egg.